f The Bugbytes: A little Thank You. Hi everyone. 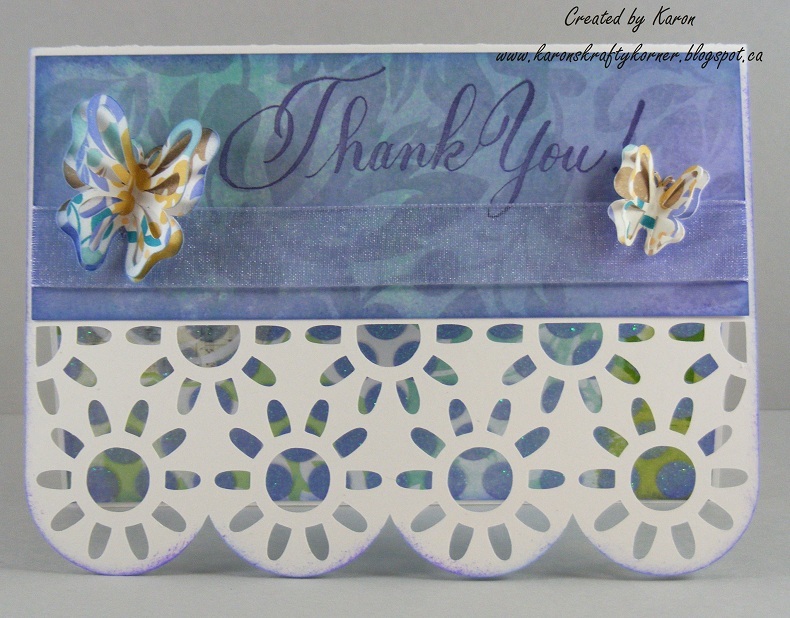 Karon here from Karon's Krafty Korner for my visit to you all her at Pam's. Thanks for having me. I'm afraid my post this month is a little short and sweet. Just a card to share with you this time. I decided to have a little play with my Silhouette Cameo and both of the cut files for this card are from Birds Cards. She is so amazing and so very generous as her files are all free. A little Thank You card (5.5" by 4") for a good friend. The base of the card is just white card stock. Then I added paper panels to the outside and inside. The papers are from an 8" by 8" cardstock pack, by Me & My Big Ideas called Forever Watercolour. The cut file for the Base card is here and the butterflies are here. 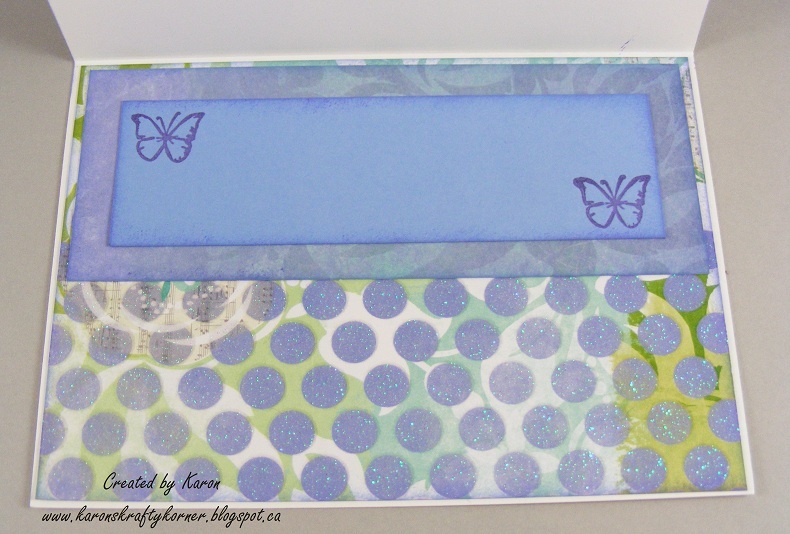 I layered the butterflies to make them pop and a little and only secured them to the card with their bodies. 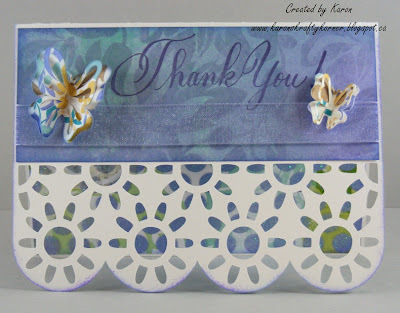 The sentiment stamp is from a See D's stamp set called Thank You for, which I bought many moons ago in the UK. A little bit of ribbon and I inked all the edges of all the layers, including the front of the base card. For the inside I used the papers from the same pack. I kept the writing panel to the top of the inside, so that when the card is closed the glitter card stock can be seen through the front pattern. 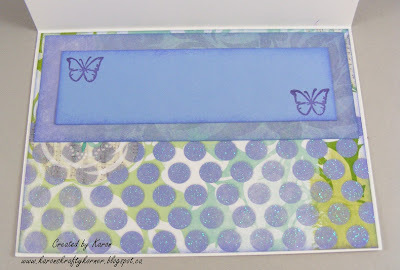 The little tiny butterfly stamp is from an InkaDinkaDo Insects Inchies set. Again all the edges of the layers have been inked. Karon this is really cute. Love the CAS style.